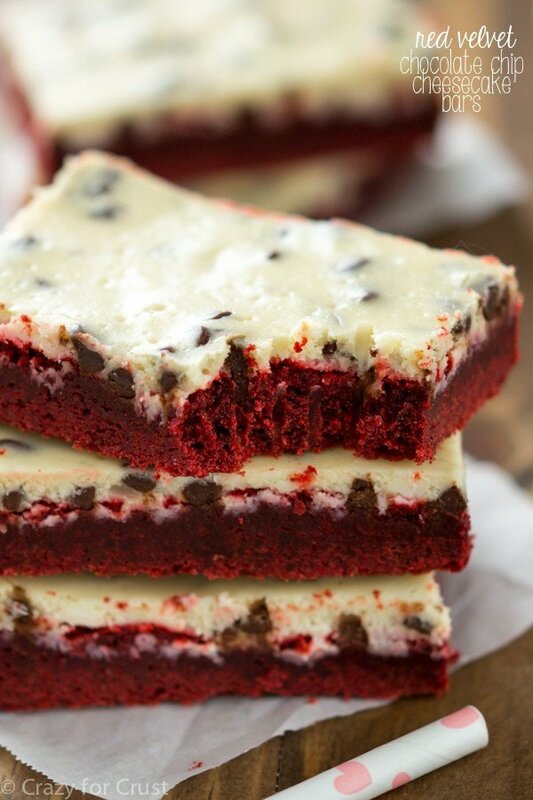 These Easy Red Velvet Cookies start with a cake mix. 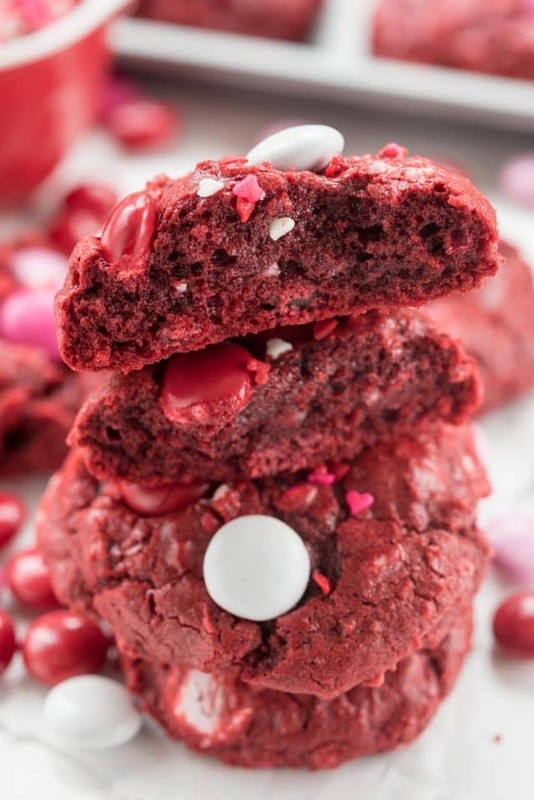 They’re gooey, soft, and chewy and the perfect cookie recipe for Valentine’s Day or any day you want red velvet cookies. The pretty sprinkles and candy just makes them even better! Everything is better with candy and sprinkles, don’t you agree? I guess I’m on a Valentine’s Day kick…or a holiday M&M’s kick. Two cookie posts in a row…that’s probably a record. I usually don’t like to bunch up recipes like this but last week I was trying to pull together a post for today and then I ended up with that gross cold going around. There was no way I was baking or cooking…and then I found these photos on my computer and was like OMG it’s a miracle. I’ve been going through old photos and organizing things lately and I have to admit: I’ve found several recipes I made and never posted! They run the gamut from cookies to bars to no-bake to dinner. I have lots of SQUIRREL! moments when I’m creating recipes for this site: I have a recipe ready to go and then I get another idea and another and another….etc. When you’re making cookies for a holiday, they need to be EASY, which is why these cookies are the perfect recipe. They start with a cake mix, and with my easy recipe you’ll get gooey, soft, and chewy cookies that will make you wonder why you ever made cookies NOT from a cake mix. See how gooey they are inside?? I absolutely love cake mix cookies. Besides the fact that I don’t have to measure sugar and flour, they turn out perfect every time with this recipe (no matter what cake mix you’re using). 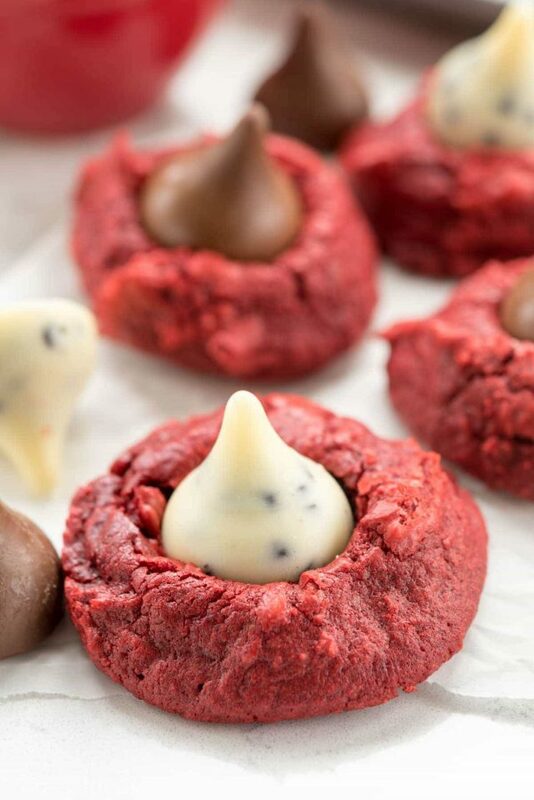 Make Easy Red Velvet Cookies for Valentine’s Day or any holiday; since they start with a cake mix they’re perfect every time. Check the size of the cake mix you’re using and make sure the size is 15-16 ounces for the recipe to be successful. Using butter instead of oil gives a delicious flavor. You can use this same recipe with any cake mix flavor. There are two different brands that make red velvet cake mix: Duncan Hines is the most popular, and some stores carry Betty Crocker. Add your favorite add-ins instead of the M&Ms if you prefer. Chocolate or white chocolate chips would be yummy! 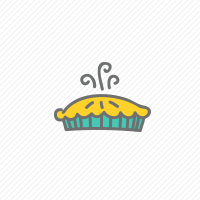 Don’t over bake them. These taste better slightly under done. 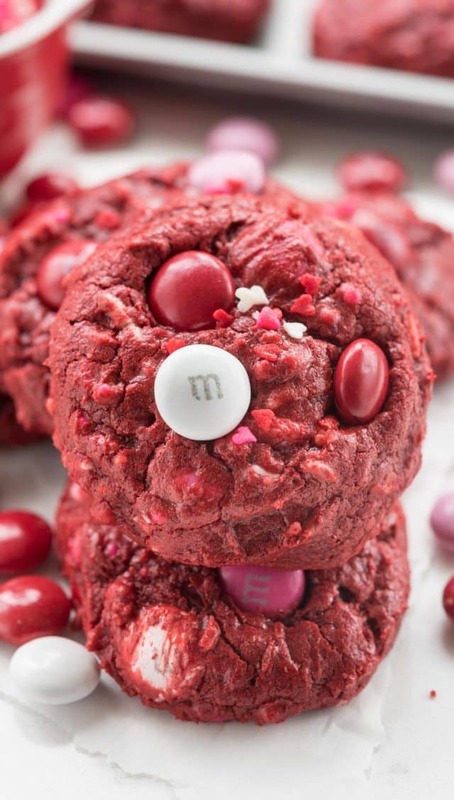 Easy Red Velvet Cookie Recipe - this fun cookie is soft and chewy and gooey too, and perfect with M&Ms. 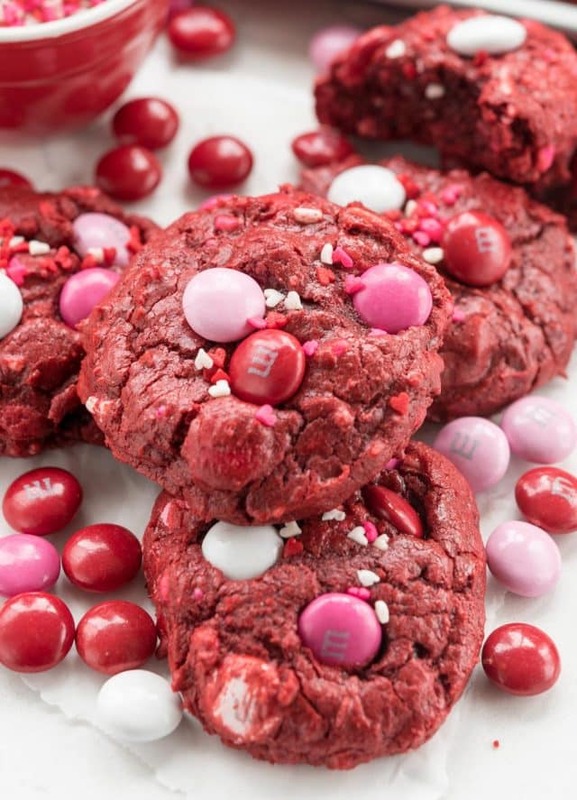 They're good all year round but red velvet cookies are perfect for Valentine's Day! Place cake mix, eggs, and butter in the bowl of an electric mixer fitted with the paddle attachment. You can also use a hand mixer. Mix until a smooth dough forms. Stir in chocolate chips or M&Ms and sprinkles (if using). Scoop 2 tablespoon sized cookie dough balls onto cookie sheets lined with silpat baking mats or parchment paper. Chill for at least one hour. Preheat oven to 350°F. Bake chilled cookies for about 11-13 minutes, or until the edges just start to get golden brown. 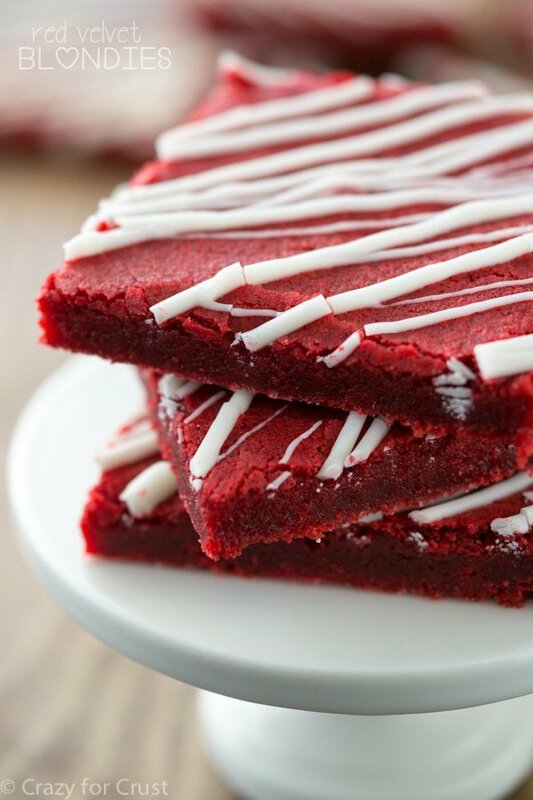 Love red velvet? Check out my friend Cheryl’s Red Velvet Crepes, my BFF Julianne’s Gooey Red Velvet Brownie Cake, and Chelsea’s Red Velvet Crinkle Kiss Cookies! These are perfect for VDay and I don’t think anyone but us actually realizes when our content is ‘bunched up’. Gotta love finding something on your hard drive that fits the season perfectly that you semi-forgot about. That cold/flu…everyone has had it this year, terrible! We love cake mix cookies! These are so pretty and festive!